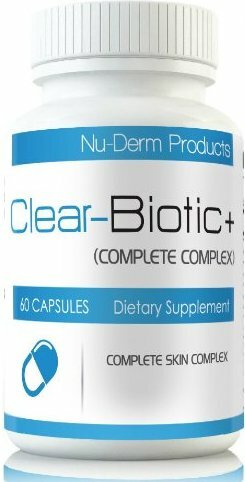 Clear-Biotic: The Probiotic Supplement to Clear Acne? It is sold by Nu-Derm Skin Care. There is no information concerning the location or phone number for Nu-Derm on their website. What Probiotic Strains and Other Ingredients Are in Clear-Biotic? No information about which types of microbes in provided on the Nu-Derm website. The information is proprietary. They only say that there are 20 billion CFU/g. If you need help understanding why that number is meaningless, see my page here. Some sources of vitamins A, B2, C and E??? The FOS and BioMos are prebiotics. The rice flour and magnesium stearate would be flow agents. Please verify ingredients of any supplement prior to taking it. What is the Recommended Dosage of Clear-Biotic? The recommended dosage on the product is 1-4 capsules daily, preferably with a meal. What Are Some Reviews of Clear-Biotic? “...We started using this product about two months ago for my teens acne. We found that when he takes it, it reduces acne outbreaks and redness. You can expect to see some improvements in as little as a week. Clear Biotic will not completely eliminate you acne problems but it will help prevent acne, reduce the redness and severity while improving your complexion. What Are the Pros of Clear-Biotic? What Are the Cons of Clear-Biotic? The website does not disclose enough information on what exactly is in the product. Saying it is a proprietary probiotics formula with added vitamins A, E, C and B2 is too general for my comfort. I like to know the exact microbes in the product and exactly which forms of vitamins are in there, too. If it has poorly-absorbed forms of vitamins, those vitamins will provide little, if any, benefit. The company does not provide a phone number on the website. They appear to rely on their contact form only. The product is not guaranteed to be free of any common allergens. No information about what is NOT in the product is available. If the Amazon.com answers are correct, then this product contains very low numbers of Lactobacillus and Bifidobacterium species compared to most other multi-species probiotic supplements. One capsule contains only 744 million CFU total. The 20 billion CFU/g number is meaningless. You don't know which strains are in the product since the information is proprietary. It is not possible to predict what effects on acne or digestive health this product will have, or even if the strains are stomach acid- and bile-tolerant strains. It is unknown if the total CFU is at the time of manufacture, or at expiration, so you don't know if you are really getting the amount listed on the label by the time you take it. This supplement contains FOS, a carbohydrate prebiotic to support the growth of the microbes, which may pose problems for some people even though it is at an amount less than 1 gram per 4 capsules. Clear-Biotic contains BioMos, which if it is the same Bio-Mos that I know of, is a prebiotic derived from the cell wall of yeast (usually a strain of Saccharomyces cerevisiae) which contains proteins, lipids, and carbohydrate components, especially mannanoligosaccharides (MOS). Bio-Mos is manufactured by Alltech as an animal feed additive. There is no mention of third-party verification of either the supplies or the finished product to insure that the product is as pure as possible. Clear-Biotic is only available from Amazon.com at the time of this writing (December, 2015). Is Clear-Biotic the Right Supplement for YOU? If you haven't read my pages on acne and probiotics for acne, I encourage you to do that so that you gain an understanding of the roots of your problem. Clear-Biotic is a probiotic supplement that has "safe" species of Lactobacillus and Bifidobacterium, it is shelf-stable and is produced in a GMP facility. However, it is a very low-potency supplement, with added prebiotic fibers, and that could be the reason for mixed reviews. I requested more information from Nu-Derm and will update the page when/if I receive that information. One final thought is that the species of Lactobacillus acidophilus, casei and rhamnosus, and of Bifidobacterium bifidum, are available in many other products besides this one, such as Nutrition Now PB-8 , iFlora and Hyperbiotics PRO-15. The strains may be different, but there is no way to know that without knowing what is in this or the other products. The other products may not have the FOS or Bio-Mos in them, however. Thanks to Cherubs for suggesting a review of this product! You may also consider nutritional consultations to help you identify your acne triggers and reduce the dysbiosis and inflammation behind the outbreaks.